I never thought March could taste so sweet! If you didn’t watch the nail-biting game last weekend, our good old Golden Eagles of Marquette passed the first two rounds of the NCAA tournament, making it into the Sweet 16. I am not usually a superstitious kind of a girl, but since I posted about March Madness last week and ended up with good results, I couldn’t put a jinx on it! Blue and gold were my high school and college colors, so they have been in my wardrobe for quite some time now. (Yes, I still wear my sweatshirt from college and maybe even from high school. Don’t judge.) There are so many great options for your home, wardrobe, parties and even your food in blue and gold. They give me that little pop of nostalgia I need. 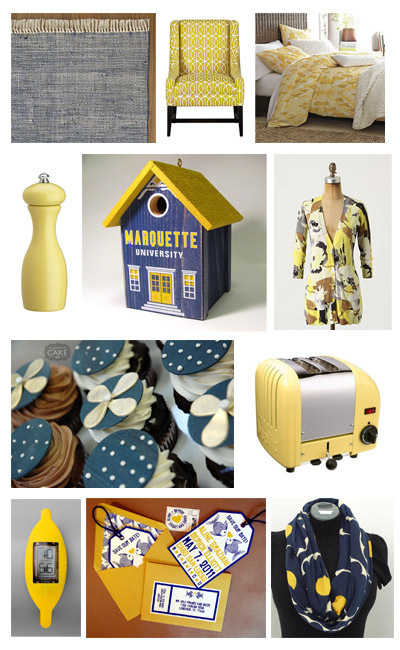 Even if Marquette is not your team, hopefully you can be inspired by some of these fab finds. And maybe even cheer us on? Thanks for finding that scarf! When I was hunting for something to wear to work this morning, I was thinking I need to find a work-appropriate blue and gold scarf to go with my gray suit. Go Marquette! I have enjoyed your site! Thank you for the shout-out in the post about blue and gold. I was rooting for your Eagles!